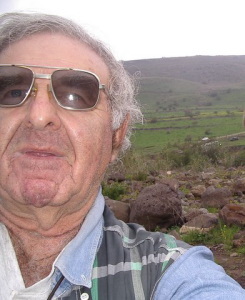 Okay early up, sunrise seen, breakfast eaten.. lets go find some bridges that River Jordan flows under…in this area. 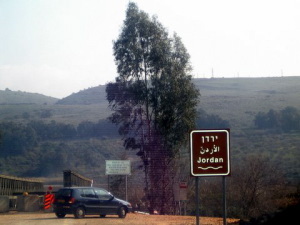 Remember we stopped at Arik bridge which is on the main road, where the Jordan flows into the north end of Kinerret (Sea of Galilee).. where many people stop and walk across to the other side..often seeing kayaks and canoes on the water? 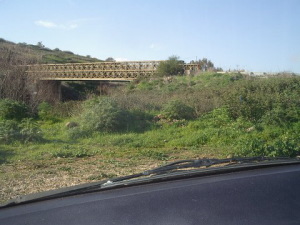 Now we go the same place and a couple of hundred meters from that Arik bridge is another old wooden bridge across the Jordan.. I have never seen people here altho’ its a beautiful spot..and definitely warrants a few minutes drive on the back road to get there. We get into Jordan Park http://www.weekend.co.il/maslulim/ramatg/p_yarden/indexE.htm where many bridges cross the Jordan and also many walkers bridges have been built. In the summertime this is a hive ..thousands of campers and holidaymakers and the place is packed, and hot and muggy and everyone just love what they are doing. I was lucky to drive there on a cold wintry day and the places were deserted, and I met a man in charge of kyak rentals camping complex, who invited me to sit and drink coffee with him, and chat, as he is alone for many days. 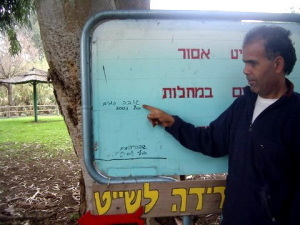 He took me around and explained a few things about the place, and led me to a notice board which showed the height of the Jordan River when in flood a few years earlier. 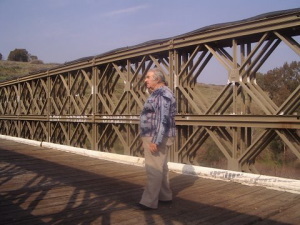 Many small “walkers bridges” have been built and in some places the Jordan River has been diverted into narrow streams and is less than 15 inches wide..yes 15″…nevertheless it IS the River Jordan and the Ole-Man river..just goes flowing along. 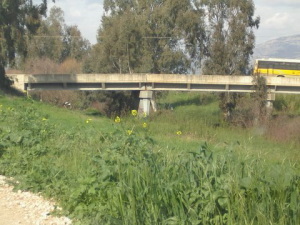 I’ve previously told about the bridges at Naharayiim and the story about Aunties bridge. Now we will take a short drive to the ruined Aunties bridge, but there is really nothing to see other than broken concrete. Anyway its worth a short climb over the the rocks to see the Jordan flowing peacefully like a little stream. 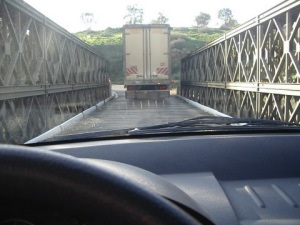 Note..the Aunties Bridge may have looked similar to the one in the picture below when seen from high up as it was a simple concrete bridge through the water. which are known as Jacobs Daughters Bridges..one of which had been (recently) totally rebuilt for two-way traffic, and now looks like any regular bridge.. with metal handrails and a very narrow sidewalk..
and will remain as a tourist sightseeing attraction. 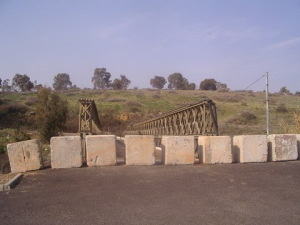 While on my “finding Jordan river bridges” mission..
there was always “another one” to find and cross..and the last one I found and crossed is an ordinary concrete bridge..leading to a moshav Khulata. On one trip with scooter I arrived at a point from where I could see a long straight gravelroad with the river on left, and I wondered if that will take me to a “Jordan River bridge” as it was not marked on my maps..then I had a flat tyre and luckily had a tin of foam that inflated the tyre to allow riding for several kilometers to a pump. 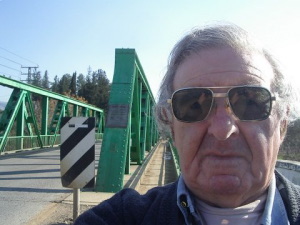 I took the long gravel road and found the final bridge, a simple concrete bridge without any name or descriptions… which I crossed and have since returned several times. 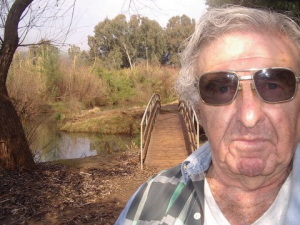 That first time, I then crossed a very small bridge at a gate and carried on riding on another straight road on the other side of the river… and to my surprise I took a turning that took me via the back road.. and I scootered into the Khula Nature Reserve. On that occasion I was made welcome by the security and other people who worked at the visitors center…many making a fuss about the scooterman coming in the wrong route. 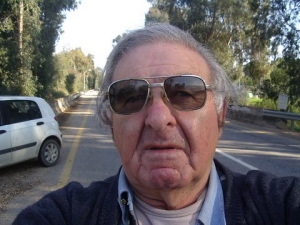 On another occasion in a rentcar I took the same roads and on entering the reserve I was followed by security who told me I should not be on that road, as the small gate should have been locked..?? and I was escorted to the main entrance gate, to leave the car in the main car-park. 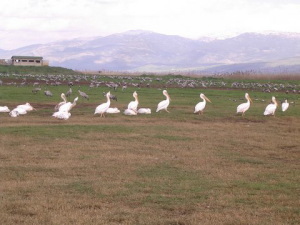 There are no entrance fees into the Khula Reserve but no private vehicles are allowed inside the reserve, as many visitors hire tricycles and walk on all the tar roads as well as all the side roads to the bird fields. So I believe I found every bridge that crosses the river… and with exception to the 3 border crossings, I have crossed and walked over every bridge..even all the walking bridges inside the Jordan Park. Unfortunately, not everyone respects the ole’ man River Jordan, and some places are full of garbage..even a supermarket trolley, and very often there are build-ups of branches and small bushes that are washed away in storms or big winds. and I actually couldnt recognise it as a bridge..I was lucky to see a tiny sign about 12 inches square nailed to a tree, faded word reading…”Shalma” (name of that bridge). 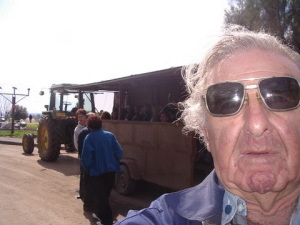 There are many activities and pedalcars and golfcarts can be hired to ride only on paved roads, and I suggest we go on tractor ride into the bird areas..tractor pulls a closed trailer with seats and gets us close to almost touch the various birds. Dont forget your binoculars and cameras. 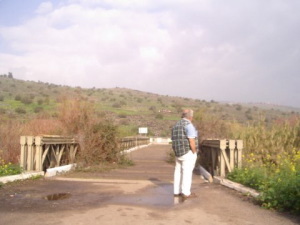 By the way..there are also several unimpressive bridges that cross the man made canals, when the Jordan River was diverted..to become the nature reserve that we see today. During certain seasons there are hundreds of thousands of birds on the ground..everyone pecking at something on the earth..and surely every bird has enough to eat. Occasionally a few thousand will take off and fly around in a big circle above us..then land and carry on pecking. I have also spent time in a birdwatching “building” where expert birdwatching guides and rangers will answer questions about what can be seen through the openings. Saturday is always busy and I was “clever” to return another day when I was given VIP treatment without large crowds..and every facility will be open and available. I was the only passenger on the bus that takes you around the complex and the driver answered all my questions and gave much advice, and suggestions. After a tiring but very satisfying few hours we have a snack n coffee at cafetaria, and head back in the dark to spend our final night at Kare Deshe. Sorry it took me a couple of days to get here but I finally made it and as usual, a wonderful trip you showed of some bridges. 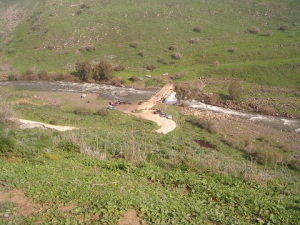 I never thought much about it but you’d think the Jordan River (River Jordan) wouldn’t be muddled up with garbage. I suppose there are pigs in every country. And, by that, I mean people who litter and don’t care much about the environment. Thanks for letting me join you on your trip! Again, thanks for following. So far, has been a colorful trip..
and crossed lotsa bridges…and ole man river Jordan keeps rolling along. Not to forget seeing blue skies and white clouds ..also grey clouds..
and rain and dust and floods. Stay with, and in future travels (soon) we will be at Mediterranean.